For the past two years, many con goers, as well as myself, have had bad experiences at Anime Expo. To the absurd weapons policy, to rude staff and volunteers, to prop breaking. Needless to say, those were the dark times. I am happy to report that there were changes this year. Good changes to benefit a fun convention for both staff and volunteers to con goers. This is a first for me to say, especially since I started working for California Convention Blog. Pre-registration on day zero ran smoothly. Please allow me to elaborate. The schedule stated doors would open at noon. The doors opened at ten am. Con attendees received their badges within half an hour to forty-five minutes after the doors opened. This, in my eyes, as well as attendees, is a major improvement. No heat strokes were reported. Another change to the pre-registration schedule was the badge pick-up times. Badge pick up was twenty-four hours. If you arrived at between eleven pm and one minute to mid-night, you were able to pick up your badge up one minute after midnight. The shuttles ran twenty-four hours a day as well. The drivers were respectful to con attendees. This is to be expected, so to speak, especially if you were transporting people to and from places. From the hotel to the con center and back to the hotel. These drivers received gratitude from con attendees entering and leaving the shuttles. The night of day one, in fact, one driver had told myself and whoever was on the shuttle for the night that this was his last run for the night. He played music as he drove. It wasn't up too loud, nor was it inappropriate. The male driver made his last ride for the night a "party bus" as con attendees call it. Night one, the convention center showed series creator of the long-running anime and manga "Naruto", Mr. Masashi Kishimoto's final Naruto movie called Naruto: The Last. Now, since this movie came out and premiered online, the hype with the fandom has been strong. For over ten years, the series has been loved, and still is. The room was packed. The movie, with English subs, was just as beautiful as it was when it first premiered in Los Angeles. A full house. But, this is to be expected when the fandom is as popular as ever. Speaking of Naruto, his Japanese voice actor, Ms. Junko Takeuchi, was a special guest. She was signing autographs near the FUNImation booth on days one and two, from two pm to about three thirty pm. Unfortunately, I could not get a photo with her, as I did not wait in line to get her autograph, I apologize for that. The line for her autograph was ridiculously long. Though, congrats to those who were able to obtain auiographs. Day two was very busy. 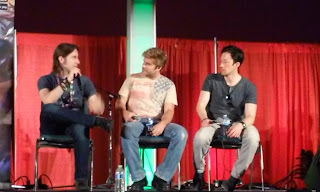 I was able to attend two panels that night, before I left early from con. Soul Hunters held a premiere panel, with a few of the voice actors from the game, held in the 21+ Lounge. The game was created by Lilith Games. Lilith Games was established on May 10th, 2013. It is a leading Chinese (Shanghai) mobile game developer. The company is devoted to developing the most engaging mobile games and creating unprecedented gaming experience for players around the globe. The game is an innovative Hero Collection rpg game for PC and cellular phone. The plot for the game is as follows, "A dark curse has been cast upon the kingdoms and it's up to YOU to Unite the Heroes and Break the Curse! Reclaim corrupted Soulstones, and Lead Your Party to Victory!" If anyone is interested in downloading it the link is here. For more information on the game, the link for the Facebook page is here. I was able to obtain some photos of a few of the voice actors in this game. I apologize for the photo quality. These were taken from my cell phone. The man in the red shirt is the creator of the game. Unfortunately, I did not catch his name, but as soon as I find out, I will give him credit. 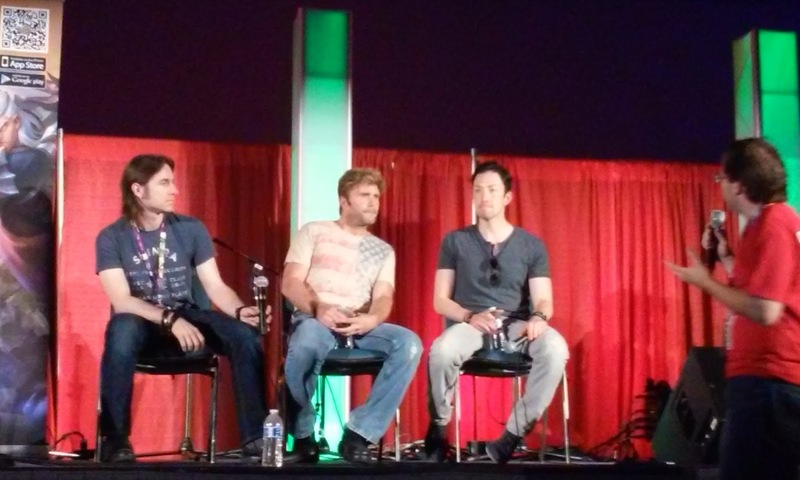 From left to right: Matthew Mercer, Vic Mignogna and Todd Haberkorn. The voice actors, along with showing up to promote the game, were holding an autograph session. Special cards were given to each person in line. Unfortunately, the voice actors were allowed to only sign the cards. This, of course, brought my hopes down. The photo below is my loot for this event. 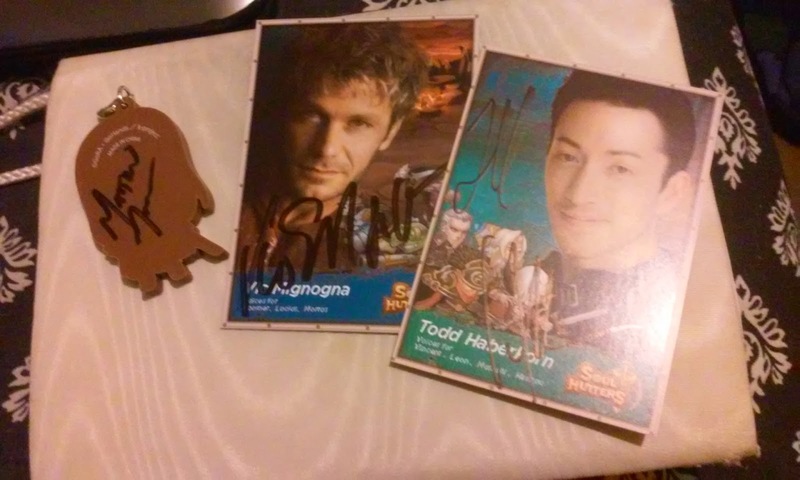 Autographs from the Soul Hunters premiere party. The key chain is the character, Kuroh Yatogami, from the anime series, K-Project. It is Kuroh's movie attire. How does this tie into the event, you ask? Kuroh is voiced by Matthew Mercer. He kindly signed the back of my Kuroh key chain, despite the rules applying to the cards only. Vic Mignogna, besides autographing the card seen above, also signed right below the character he voiced in Sengoku Basara, Akechi Mitsuhide or Tenkai, depending where you are in the series. Not many recall he did the role, nor does Mr. Mignogna remember the voice. I've met Mr. Haberkorn before, at an Eyeshine concert in Los Angeles. So, this was not my first meeting with the popular voice actor. However, it was good to see him again. Octopimp, also known as Alex, is one of the creators and voice actors for the parody of Free! Iwatobi Swim Club anime. He and the co-creator of the popular abridged series, 50% OFF, Sparkytheandroid, along with voice actress, Kira Buckland, held a q and a panel for the YouTube series. The room was packed. This should show how popular the abridged series is. The same could be said for the actual anime, as well. The trio showed the newest episode of the popular parody, as well as answered questions from fans. The link here is the panel video, taken by a close friend of Octopimp and Sparkytheandroid. The questions were appropriate and the fans and voice actors loved how happy the fans were. There was love in the room from everyone. Unfortunately, I had to leave early so I missed out on the autograph session. The Entertainment hall was just as organized as ever. The different scenarios were very useful to cosplayers and photographers. Different back drops and even a ball pit were included, like last year. This was a good part on the convention's side. It was crowded, but with good photo shoot back drops, this is to be expected. There were seating areas in the hall as well, for those who were tired or just needed to rest up. It was a well organized room, split up accordingly. This year, a new policy was introduced. At certain resturants, attendees could get a discount on their meal by showing their badges to their waiters or waitresses. An interesting idea, considering how often attendees go out to eat or how much money they carry on them, after room fair is paid. Now, the least fun part of this review. As we all know, I am known for being terribly blunt about the mishaps and wrong doings at Anime Expo specifically. So, without further delay, the cons of Anime Expo. Surprisingly, there were very little this year. AX Weapons policy and I do not mix. Please allow me to elaborate. Unlike the past two years, it seemed to be okay to carry a sheathed katana with no problem, but any prop guns had to be painted neon colors, broken triggers and have a neon strip of tape on one side. This would ruin the paint job on said prop gun. I fail to see how painting a prop gun bright neon colors with a strip of neon tape down one side is far more dangerous than a sheathed katana. Yes, AX posted a video on what was okay to bring and what wasn't. Though. given how bad the weapons policy has been the past few years, it is no surprise that this year's policy was terrible. As I like to say, and many believe the same, the prop makes the cosplay. A Yoko, from Gurren Lagann, cosplayer had the neon pink tape placed down one side of her prop gun. The tape will ruin the paint job once it is removed. According to her, she said the paint cost one hundred dollars per can. Is this what the convention wants? To ruin prop weapons for the sake of their con safety? I honestly don't know what to think anymore. Will there be no weapons allowed next year at all? That is my question to Anime Expo. Will no prop weapons be allowed if you keep changing the policy and making it far more difficult for cosplayers? This is a legit question. According to my co-worker, Ryan, and multiple people, the convention center staff, not the con volunteers, were completely rude to members of PRESS and con attendees. A prime example would be this. During day zero, after badges were received and picked up, members of PRESS, convention volunteers and con attendees could not use the bathrooms inside the convention center. They were turned away. So, instead of the volunteers being rude, it is the convention center staff? How does this make sense? Is it because the convention center is going to be renovated after con? This is a similar effect like Anime Los Angeles. Hotel staff were rude to con goers staying at the hotel this year. Am I seeing a pattern here? Though, there were minor reports of AX volunteers being rude, but it wasn't as bad as previous years or this years convention center staff. Badge checking was heavy. However, in West Hall, to get inside, the convention staff was not checking badges. It is a safety hazard. Crowd control was bad enough day two. But, convention staff is supposed to check badges at which ever location they were located at. As PRESS, I normally get into special events with no problem. As of two years ago, things changed. Now, tickets are needed to get into any special events. Con attendees have to pay for these, but now PRESS has to as well. Yet, Premiere pass holders were fine and could get in for free. How is this fair? My co-worker tried to get into one of the concerts. He could go in, but without his gear. He and I are PRESS. If we cannot bring our gear in, how are we supposed to do our jobs? This didn't make sense to me, but by day two, and I can confirm this with others, tickets were passed out to PRESS for special events finally. It was possibly to make up for the mistake of not allowing those whom review the convention as a side job to accomplish their jobs. The J.W. Marriott issued wrist bands to those rooming at their hotel for the convention. However, only up to four wrist bands were given. So, those who had more than four people in their rooms were in trouble. It had come to my attention that the J.W Marriott treated those in the convention block badly. I am only assuming it is due to cosplayers not being the high class guests they are used to, such as business people. This mistreatment of cosplayers at their hotel is unjustified. A hotel guest is a hotel guest. There should not be any difference in how people are treated. I am going to suggest this, to anyone rooming at the J.W. Marriott next year, get a room that is not in the convention block. I only suggest this because everyone deserves to be treated fairly. It is a pattern now with AX. Their guests are good. But, are they just thinking of nothing but money and the profits they can gain from their special guests and the tickets to said events? Con attendees want to enjoy a con and not pay an arm and a leg for badges and special events. It would be appreciated to have a convention think of the attendees, than the profits to be gained. I'm not saying Anime Expo has changed from the past two years. It has. I am proud of how the con changed, but is it enough? How much is the convention going to change to please con attendees? Not all conventions are all about money. The people attending come first. This is my personal belief anyways. Am I saying Anime Expo is a bad con? No and Yes. The changes they have made are astounding. Far better than the previous new years. New staff and volunteers, better crowd control, though the weapons policy could easily be questioned. The guest list is always beautiful, the panels and gatherings a plus. Even a place for those twenty-one and up to have a drink and relax with karaoke not even down the hall. There are still changes that need to be made, but overall, the con is one to go to. I look forward to what Anime Expo does next year, whether I attend it or not.